A series of four books that provide extensive guidance and English practice in key areas of the language. 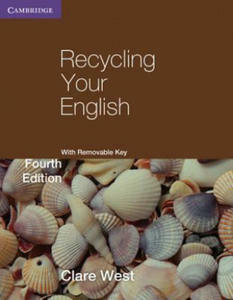 Recycling Your English: Fourth Edition provides extensive guidance and practice in five key areas of language: Grammar; Phrasal verbs; Vocabulary; Word study and Writing. This popular book has been revised throughout to take account of recent revisions to the FCE syllabus, and has been expanded to include a new Writing unit on Reviews. It can be used to supplement any coursebook at upper-intermediate level, in class or for self-study, and is suitable for students preparing for the Cambridge FCE or IGCSE in English as a Second Language examinations.